That dastardly switch from downhill to uphill I have experienced more than once. The Tucson Half Marathon is all downhill except for one brief hill at mile 11. It’s short, pathetically brief, but it KILLED me. And a month ago I ran the Crazy Horse Marathon, which is downhill from 0-13.1 and then uphill until mile 20. Brutal. This post is much different from your Chicago recap. While your marathon story was more methodical, this seemed to come from a wilder part of you. Less about numbers and math and more about gut feelings and sheer visceral energy. I guess that’s what trail running does to people. I’ve only done two trail runs so far and while I enjoyed them, I’m certainly not ready to dominate them yet. I too learned some harsh lessons from those experiences and I will carry that wisdom into 2013, a year in which trail running will feature prominently. Anyway, congrats on that hard-earned It’s It and even more so on cutting 4.5 minutes off last year’s time! Ah fellow East Bay trail runner, you may be quick to use the word “crazy” now, but it’s a solid bet I’ll see you and your speedy Gypsy Runner at the start line next year! I thought I was following you this whole time! I admire people who enjoy trail running because aside from the scenic routes, I think I’d end up more like your Russian friend, or the guy who tossed his cookies. Congratulations on earning your coaster! I think next year will be the year that you break the top 3! (sidenote: I actually went to a small school called Saint Mary’s College in Moraga which I think is probably somewhere right around the race course. Your pictures brought back happy memories of hills and unbelievable fog!). Thanks, Amy! My two-dimensional photo doesn’t even do justice to the impressive spikes on the coaster. Don’t sell yourself short, I’ve no doubt you’d be as strong on trails as you are on roads… the terrain may be different, but the patience and work ethic are pretty much the same. We’re obviously lucky in the Bay Area, though Albuquerque struck me as having a lot of trail running potential when I was there 3 years ago (unfortunately I didn’t have time to explore). Scenic trails are great both for hill training and, at the same time, for distracting your mind from the hill you’re training on. That’s cool that you’re a Gael, I’ve run many a mile by Saint Mary’s and through Moraga. And Las Trampas is just a few miles from Moraga. Running with Brazen has introduced me to a lot of East Bay trails I probably never would have found myself… but now that I know about ’em, I’m never short of options! That is one thing I like about trail racing. The positions change a lot more. You pass people on the uphill, then they pass you on the downhill. Everyone has their strengths and you have to work with that. I also like all the snakes I see on trail. This October will be my first “Rocky Ridge Half”. Reading about it sent a chill down my spine. I have been inactive (only 7-9 trail races over the last 3 years) and dread the thought of a “tough” Half. However, I will be there this year and hopefully survive. Hmm, I certainly didn’t write this in the hope of intimidating future runners! On the contrary, I love Rocky Ridge for the challenge it presents, and the Brazen folks do a great job in supporting all their runners. None of the footing on the course is particularly technical, it’s just a whole lot of fun ups and downs. 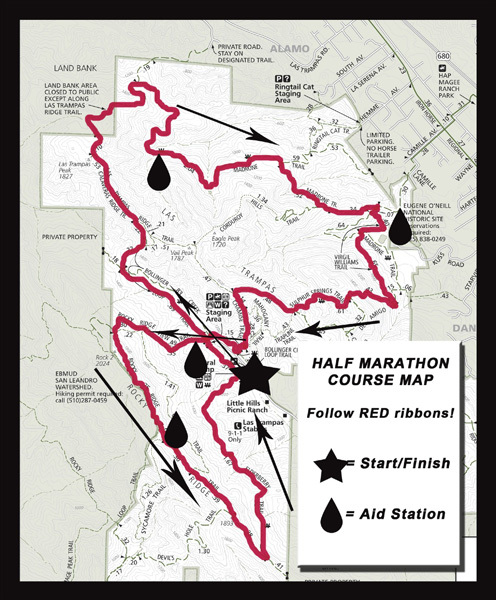 And once you conquer Rocky Ridge (and you will), you’ll be hard-pressed to find another half marathon that feels tough by comparison. Plus, the flaming tiger makes for a pretty cool medal. I think the important thing is to respect the course, without fearing the course. The fact that you’re doing your homework so you’ll know what to expect on race day is a smart move. I had no idea what I was getting myself into the first year I ran it, so the second year felt much – for lack of a better word – smoother. Best of luck David, I’ll look for your name among the finishers!